This outfit was sewn by my friend Jerry. 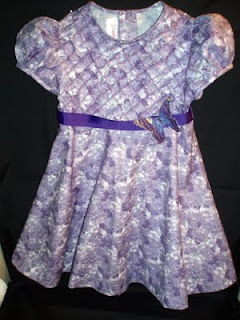 She does the most amazing designs and really is an expert at mixing fabrics. She call this "cute little witch top". 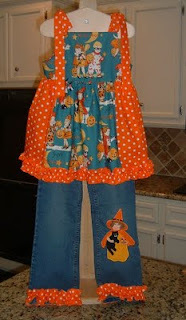 I love the embroidery on the jeans and you might also notice how she did the ruffle. 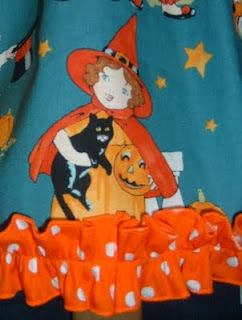 This is the third year in a row we have used this print for a Halloween outfit; but the last two years the print was on an ivory background. My daughter found this fabric on her recent trip to NYC. 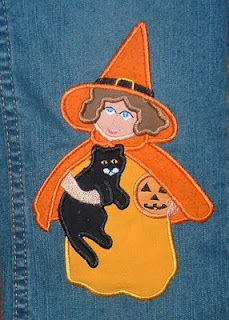 Then she scouted out the embroidery sites and found an applique designed to match the "Cute Little Witch" in the print from http://www.divadoodles.com . I tried to match the applique fabrics as closely as I could to the print which left off any touches of the teal of the background of the print. We will pretend the jeans will represent that color. I actually had an orange tee, but failed to put either that one or a white one under the top for pictures...sorry! 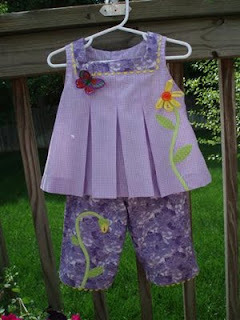 My friends are still sewing up a storm, so I will share a great inspiration from Karen. 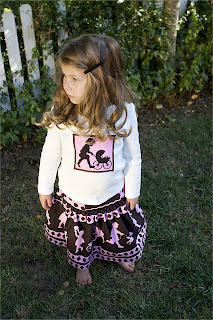 The skirts, tops and headbands were made for her granddaughters. When she sent me the pictures she said I could pick one, little does she know I am going to share more then one. The girls are just to darling in their skirts, so how do you pick just one?? What a great idea, thank you Karen for sharing. Since spring is right around the corner. 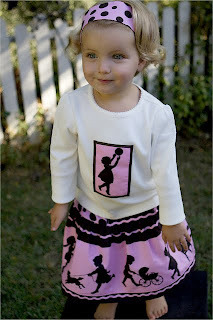 I thought maybe you need a reminder to add sometime fun when sewing for little people. 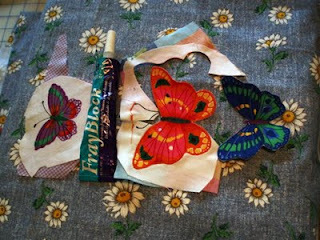 I know you will want to add this little butterfly to your own design: So here are Betty's instructions. A: Top, middle and bottom shows drawing on transfer paper, paper ironed on the back, peel paper off and iron on the lining. B: Tiny zig zag in matching color on the very edge of the wings, cover body in a darker thread covering it solid. Use fray check or fray block around the edges, let dry well. Second picture shows cutting away the extra fabric. 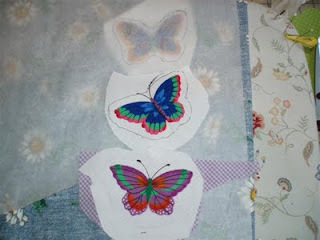 Bottom picture shows completed butterfly. C: Attach butterfly by straight stitching around the edges of the body only: Either embroider black "feelers", use a thin script perm marker or heavy carpet thread with a knot on each end and tack in place. Bend the wongs up and curve. The same idea can be used for flowers, ect. 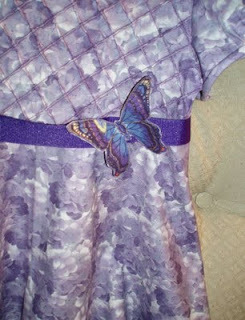 As I work my way back to the sewing room, I would like to share what some friends are sewing. This dress called the MURPHY'S LAW DRESS, is anything but that in my mind. I think it is perfect and so inspiring. 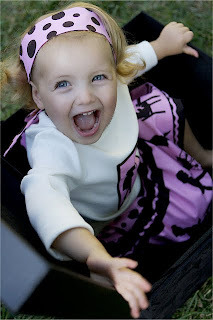 The dress was created and sewn by my friend Betty. 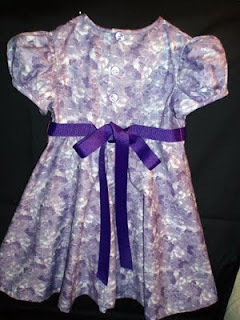 Betty said, she had trouble with every part of this dress: Thinking the problem might have been from not having ebough fabric to do what she wanted. 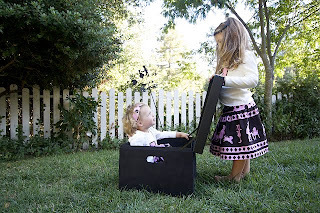 I can only say, the dress is adorable and so inspiring to think out of the box. 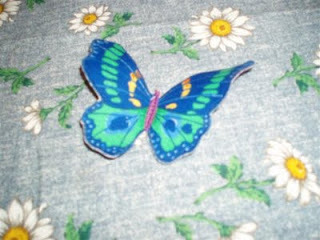 You might notice the butterfly, which is also a Betty creation.